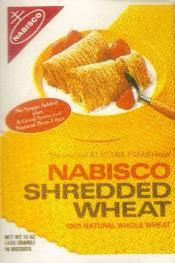 Nabisco Shredded Wheat and Post Grape-Nuts were my favorite cereals growing up but I did not care much for Cherrios! Except for Grape-Nuts all my favoreite cereals were from Kelloggs Brand! This may be the only breakfast cereal that's still packaged the way it was in the '50s; the box contains several paper 3-packs. All other boxed breakfast cereals now seem to have plastic bags inside the box, and they're frustratingly difficult to open... even for adults. my father use to eat a lot of them too.I buy the small sugar-coated ones.They are really good. My dad ate this for breakfast every morning his whole life. I have a tuna salad with fibre1 as croutons. As a kid, I tried lots and lots of cold cereals, from Alpha-Bits to Wheaties. Life ranked up there for a while, but I'd say that Rice Chex were probably my overall favorite. I still enjoy them, although nowadays I tend to buy Quaker 100% Natural Oats, Honey & Raisins Granola more often. It stays nice 'n' crunchy in milk. AH, Sorry Tommie, I was "KIDDING", being "SARCASTIC", just "JOSHIN", only "RIBBING", a minor "EXAGGERATION" basically just trying to entice a giggle or two. I thought 3lbs was enuff of a quantity to insure A JOKE!! Oh well. Next time I'll use 13.5lbs. Thanks anyway Tommie, at least you read them. Have a great day. Since FROSTED MINI WHEATS hit the stores shelves, I have not had this type. Same with CORN FLAKES.....Tony the Tiger's GRRRRrrrrreat for me. My favorite cereal of all time is RICE CHEX and I get to add the 3lbs per bowl of sugar. What's your favorite cold breakfast cereal? By "spooner" do you mean that you crushed the biscuit with your spoon, in a bowl of milk? That's what I did.